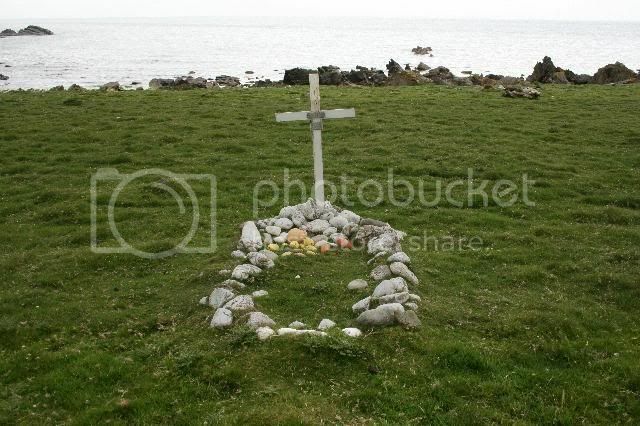 EMDEE wrote: I last visited the Inneans Bay in 1997, and noticed that the Sailor's Grave was in a dreadful state. I can remember it in the 1970s when it was adorned with glass fishing net floats, and there was even a poem inscribed on the cross, and it looked as if it was being looked after. 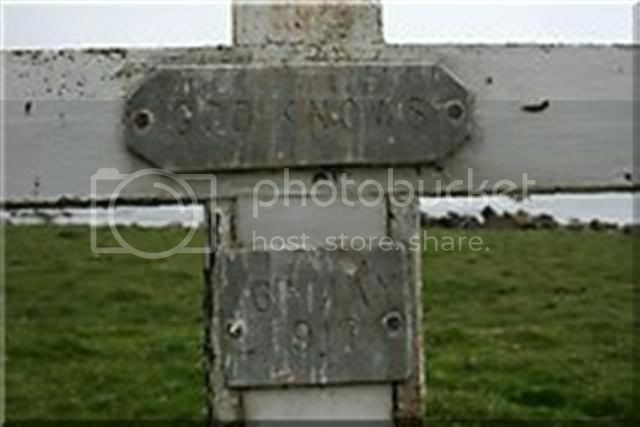 In 1997 it was overgrown and the cross was lopsided and tied together with orange twine. I actually took a photo of it which I have somewhere in the house. Can anybody who has been there recently give an update on the state of the grave? Does anybody know who used to look after it in former years, as there must have been somebody tending it? The sailor has been a presence at the bay for almost a century now. 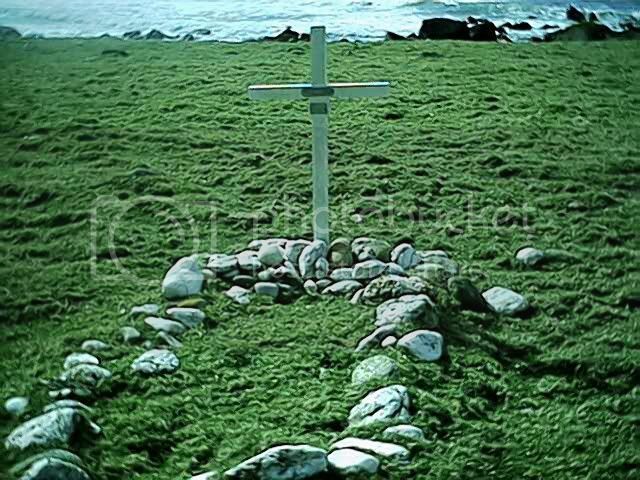 EMDEE, the first two pics were taken by me some 7 years ago or may be more, the other two were taken by a friend in June last year.As you can see there has been little change to the cross and is in good condition thanks to visitors whom do there wee bit to preserve this grave. 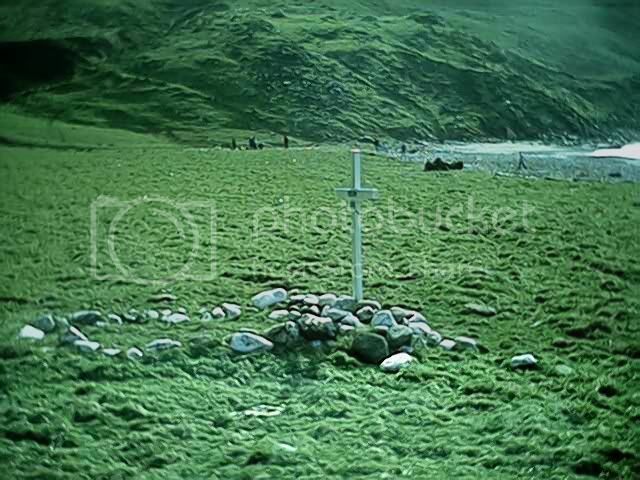 I think I know of one person whom I was told gives it a coat of paint regulary and attends to the stones around it.The plaques on the cross say God Knows and 6th May 1917.It is nice to know that this unknown mariner's grave receives a lot of respect from the people that visit the bay. That looks like a different cross from the one I saw, unless it has been repaired and painted. The grave itself looks in better order too. JD, we can always rely on you to come up with some good photos. Whoever the sailor was certainly finished up with a dramatic and spectacular last resting place. His grave adds something to the sense of place at the Inneans. Angus Martin's book "Kintyre-The Hidden Past" has loads of good information and anecdotes about the Inneans. According to this book, the cross has been replaced quite a few times over the years. 4th gen Suthen' wrote: I'm very interested in this. We should try and get Angus Martin's booklet 14 walks in South Kintyre on here in some form, it is very good indeed. I have walked from the The Mull of Kintyre from the car park above the lighthouse really, to Machrihanish, the Beachcomber really! twice. Both times on the first Sunday in May, any later and the bracken would be getting high. It is a very interesting and challenging walk. I think it took about 8 hours but that included lots of stops and detours to CRagaig and The Ennans bay. And there is lots more than that to see....I would reccomend it..but you will need a map and compass and good weather. It is 16 walks! has anybody got a copy of it I can borrow?